Motorized scrolling banner stands put your promotional messages in motion, which is sure to attract the attention of anyone passing by. These scrolling banner stands are a great attention-getter to help draw people into your trade show booth at the show or to promote new products and services in your office lobby. The banners scrolling movement is produced by the small motor built into the stand. The banner scrolls either from bottom to top or from top to bottom - it works either way, so it's your personal preference. 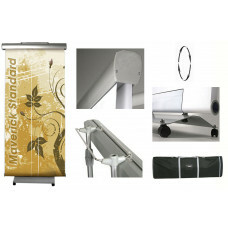 We have both a floor-standing model and a hanging model to choose from to meet your scrolling banner stand needs. Our banner stand graphics are printed at 720 dpi resolution onto a premium, super-smooth vinyl than has proven to be very durable and have virtually no edge curl at all. *** Selected product size is 28.75in x 145inThe Maverick Standard is a floor-standing scrolling..